ONE OF the most famous images of the North East of England will be offered for the first time at auction in the Sporting Sale - a sale devoted to horseracing and country pursuits - on Wednesday, November 6, 2002 at Sotheby's, Olympia, London. 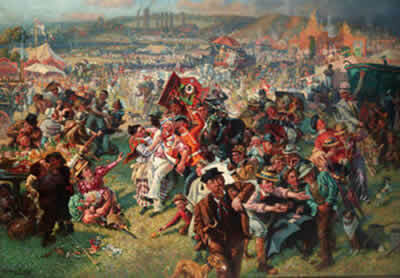 Painted in 1903 by William C Irving (1866-1943), this spectacular oil painting was inspired by the song Blaydon Races - now considered as the Tyneside national anthem and is estimated to fetch £40,000-60,000. It depicts various locals and eccentrics in a carnival atmosphere, with a horse race in the background and when it was exhibited in the window of an art dealer's shop in Newcastle, it attracted the attentions of such a large crowd that the police asked the manager to draw the blinds! The fame of Blaydon Races, which was held on a circular course on Kings' Meadow island in the middle of the River Tyne, rests chiefly on the song written by Geordie Ridley - a Tyneside music hall singer. The race was an old fixture, but not recorded in the racing calendar, until 1864. In 1862 - the year of the song - the race was called off when a heavy storm made it impossible for the horses to get to the racecourse. The last Blaydon Race was held on the September 2, 1916, during World War One and was abandoned when a riot broke out following the disqualification of a winning horse. A key drawn by the artist provides the identity of various local figures and will be sold with the painting. Like the race meeting itself, some of those portrayed have found their way into 'Geordie' folk songs with Nanny the Maser of Scotswood and Cushie Butterfield of Blaydon being two examples. Elsewhere in Sotheby's Sporting sale is a group of six padded Barbour jackets worn by Phil Sharp; a former lad at the Lambourn stables of Jenny Pitman and Charlie Brooks, who rose to fame when the 1997 Grand National was disrupted by a bomb scare. Sharp, who was responsible for the distinctive grey 'Suny Bay', volunteered to remain at the evacuated racecourse and attend to all the 120 racehorses. The race was rescheduled for the following Monday, and 'Suny Bay' was second. The six jackets relate to various important horserace meetings and are all embroidered or decorated with the name of the horse that Sharp was responsible for. 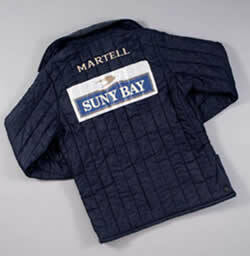 The 1997 Grand National 'Suny Bay' jacket is estimated at £300-500, as is a 1991 Grand National 'Garrison Savannah' example. A pair of special edition 'Suny Bay' jackets for the 75th anniversary of the Cheltenham Gold Cup in 1998 is estimated at £400-500. 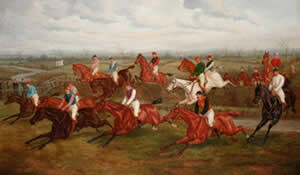 Also relating to the Grand National is a very early oil depiction of the race. The 1885 Grand National - Valentine's Brook by Edward Benjamin Herberte (fl. 1860-1893) is estimated at £15,000-20,000. 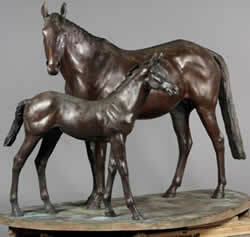 £500-800, while a life-size bronze of a mare and foal by Philip Blacker - a successful jump jockey - is estimated at £50,000-70,000. Other legends within the Horseracing world will be represented. A gold watch presented to the greatest rider of his generation, Steve Donoghue, to commemorate six consecutive victories with 'Brown Jack' in the Queen Alexandra Stakes at Royal Ascot between 1929-34 is estimated at £5,500-7,000. Inscribed Two Old Reliables - the partnership of Donoghue and 'Brown Jack' evoked some of the most affectionate and enthusiastic receptions witnessed at Ascot. A jockey's whip belonging to Fred Archer is estimated at £5,000-7,000. Archer was born in Cheltenham in 1857 and, along with his contemporary W G Grace, was the most famous sportsman in the country. During his short career, he won the Derby five times; the St Leger six times; the Oak four times; the 2,000 Guineas four times and the 1,000 Guineas twice, overall winning a total of 2,478 races. In November 1886, the 29-year-old jockey, who was suffering from depression, shot himself at his Newmarket home. Among the trophies and cups are two trophies won by 'Eastern Emperor', who was bred by Lord Milford is a silver-gilt 'Yorkshire Cup' of 1952 and a silver 'Chester Cup' of 1953 which carry estimates of £2,500-3,500 and £300-500 respectively. 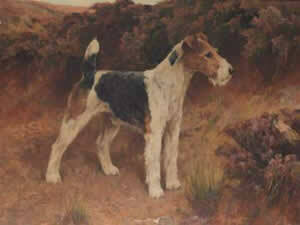 A charming study of the fox terrier 'Barrington Bridegroom' by Arthur Wardle (1864-1949) is estimated at £5,000-7,000. 'Barrington Bridegroom' was trained by Mr Frank Dunford, who achieved a world-class reputation as a show judge and a breeder of fox terriers over 60 years. His terriers were all prefixed by the name 'Barrington' 'Bridegroom' became an international champion as well as a highly successful sire. He was sold for a then record sum of 1,000 guineas. 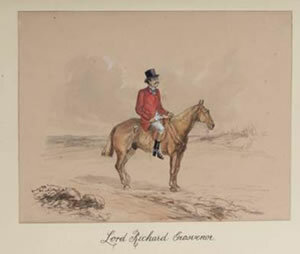 A delightful late 19th century album of 62 caricatures of the Cheshire Hunt including Lord Richard Grosvenor; Lord Egerton of Tatton; Lord Combermere and Sir Watkin W Wynn is estimated at £6,000-8,000. Other artists represented in the sale include John Frederick Herring snr., Heywood Hardy; Frank Moss Bennett and Sir Peter Scott. EXPERT EYE: A 30 minute guided tour of the sale exhibition will take place at Olympia at 2pm on Sunday, November 3.